If your pet always tries to clamber into the car and accompany you on your outing, it can be hard to say no. Dogs love the feel of the breeze on their fur and watching traffic go by. Pet-friendly vehicles with built-in guards and accessories are starting to hit the market—but they tend to come with a costly price tag. Besides, you don’t have to replace your entire vehicle to bring Fido along for the ride. 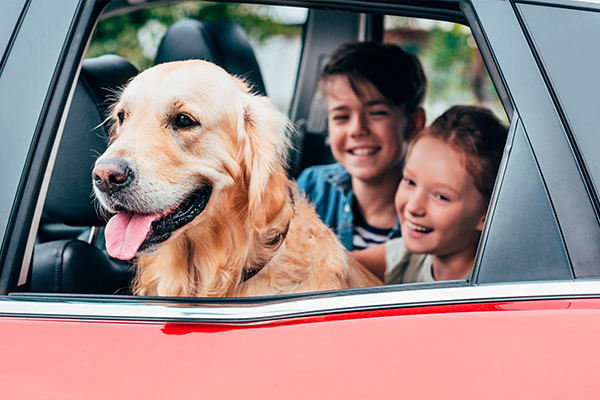 The team at Car-Registration.org recommends some minor modifications you can make instead to ensure both you and your fur baby have a safe trip. It can be tempting to allow your dog to ride in your lap or the passenger seat. But this is a risky way to drive. Pets in the front seat can be a serious distraction to drivers. Plus, if you get into a car accident and the air bag goes off, your pet could be seriously injured by the force of the air bag. Instead, Car-Registration.org recommends that you put your animals in the back seat or the cargo section of your car. They’ll be safer, and they’ll have more room to stretch out. Dogs love sticking their head out the window when a car is in motion to feel the breeze. But an open window is a risk for your furry companion. Dogs can jump or fall out the window if they stick their heads out too far. An easy way to modify your car is to install a temporary window guard. The experts at Car-Registration.orginform you that a window guard will allow your pet to safely feel the breeze without jumping out of the car. There are two kinds available: a mesh guard that lets the breeze flow through but not your dog, or a holed kind, which has a small round opening that allows your dog’s head through, but not the rest of its body. If you’ve got a taller car, or an older or smaller dog, the climb up to the back seat or cargo area might be a struggle for its joints. And if you’ve got a larger dog, carrying them into the car can feel like back-breaking work. Car-Registration.org suggests helping your pets along by getting a folding ramp for your car. Ramps are available for $50 to $100, and can offer your pet a quicker and easier route into the vehicle. Most are easy to transport and put away, so they won’t take up too much space in your car. One super easy modification you can make but probably haven’t considered? Back-seat sun shades. The backseat of a vehicle often has lower air circulation than the front. On a hot day, the sun can leave your canine panting and overheated. Car-Registration.org recommends reducing the risk of burns and stress by installing car sun shades in the back seat. You can pull them down on sunny days and leave them up when it’s cloudy outside.